However, surprise is the secret weapon that this rebooted series has, which was shown by the last picture Rise of the Planet of the Apes, taking the world by storm with its earnest, poignant storytelling. Dawn, surprises with how ambitious and smart it is while additionally asking a lot of its audience. 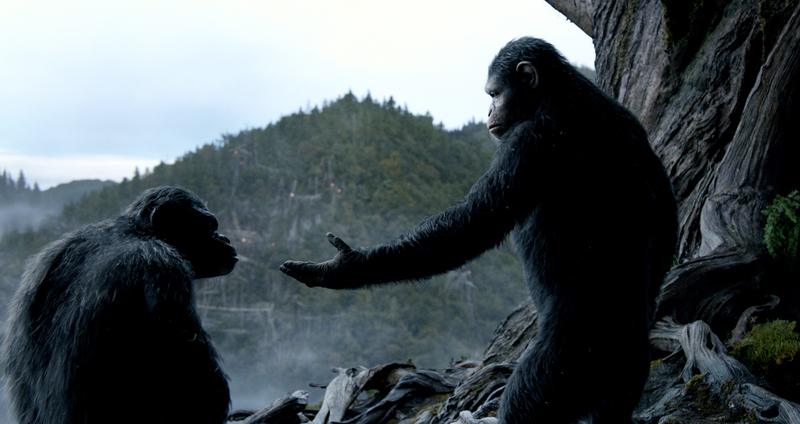 This sequence with Ceaser lasts a good 10-12 minutes, and it is mostly comprised of the Apes talking with sign language and the audience are left to read subtitles while also having to let the visuals tell the story. It is a fantastic sequence that represents an excellent fusion between, content, form and technology. The last being the innovate motion capture which enables the actor who wears a gray dotted suit to perform regularly, and their work gets recorded and rendered with CGI. Andy Serkis, who has been a veteran of this form of acting, adds interesting layers to Ceaser in this installment, conveying a sense of reluctance in his plight, grand authority and steely resolve. The film opens with a close up of his eyes and closes with a similar shot, cementing the importance of Serkis and Ceaser for this series, in equal measures. Equally as impressive is Toby Kebbell as Koba, who has this tightrope balance of being commanding and cruel, while also being quite funny. In some scenes, he conveys all three of these aspects effortlessly. The best example being when he goes for the first time to spy on the human camp. His character gets caught by two humans with guns, and he pretends to act like he is at the circus, essentially putting on a show to illustrate he is a dumb ape who has gotten lost. He gets away with it and soon after, we immediately see his disgust at his act and the humans, and then finally showing his commanding side when he meets up with his Ape friends. Elsewhere, the film in its DNA has elements of the original series. For example, the big battle that sets up the third act feels at times like the dizzying, fiery passionate revolt finale of Conquest, and a scene involving a train station called to mind a similar scene in Beneath. The most surprising element was that the picture felt like a remake of the last of the original series- Battle for the Planet of the Apes, taking key elements such as Ceaser`s rule “Ape shall not kill Ape” and Ceaser`s in fighting with an insubordinate general. However, all these elements are handled with a great amount of care, through great setup, interaction and acting. Dawn permanently joins among the ranks of its series forebears in delivering a great cerebral experience worthy of its science-fiction roots. However, unlike even some of the more fun outings, it stays the course through its great screenplay. When, Malcolm (Jason Clarke) says to Ceaser at the end of the film, we could have had a chance. Alluding to their attempts for a peaceful co-existence between both societies, you feel the weight of that, speaking to the film`s power in showcasing two societies on the brink, and how little it took to bring them both down.